"I've been described as a tough and noisy woman, a prize fighter, a man-hater, you name it. They call me Battling Bella, Mother Courage, and a Jewish mother with more complaints than Portnoy. There are those who say I'm impatient, impetuous, uppity, rude, profane, brash, and overbearing. Whether I'm any of those things, or all of them, you can decide for yourself. But whatever I am--and this ought to made very clear--I am a very serious woman." 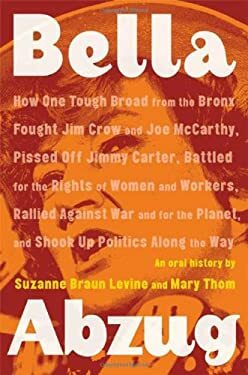 For more than fifty years, Bella Abzug championed the powerless and disenfranchised, as an activist, congresswoman, and leader in every major social initiative of her time--from Zionism and labor in the 40s to the ban-the-bomb efforts in the 50s, to civil rights and the anti-Vietnam War movements of the 60s, to the women's movement in the 70s and 80s, to enviromnemtal awareness and economic equality in the 90s. Her political idealism never waning, Abzug gave her final public speech before the U.N. in March 1998, just a few weeks before her death. Presented in the voices of both friends and foes, of those who knew, fought with, revered, and struggled alongside her, this oral biography will be the first comprehensive account of a woman who was one of our most influential leaders.